Former Sharon Imam Takes Another Wife in Lahore? I've got my ear to the ground to hear what has become of former Sharon imam Muhammed Masood, who was "voluntarily deported" back to Pakistan in Ocotber 2008. Masood was first picked up by Immigrations and Customs Enforcement in November 2006. (Previous blogposts here.) He was arrested on criminal visa fraud charges in August 2007, and he pleaded guilty to five fraud charges in February 2008. According to my sources, Hafiz Muhammed Masood is back in Lahore, Pakistan, where he is the imam of an important mosque in Lahore controlled by Jamat e Dawa (the new face of the terrorist group Lashkar e Taiba). Masood reportedly recently celebrated a second marriage to a lady in Lahore. It was quite a big event, I'm told. Masood's lawyer said this of Masood back in Ocotber 2008, "He is totally petrified of going back to Pakistan." And "he was heartbroken about leaving his wife and eight children and returning to a country where he could be in danger because he preached peace in the United States, said his lawyer, Norman S. Zalkind of Boston." Sounds like Masood is doing just fine though. What do his interfaith supporters in Sharon think of the second wife? What do his own wife and children think? Meanwhile, Masood's first (?) wife and family are still living in the Islamic Center of New England estate in Sharon, MA, and they are facing deportation charges too. The family applied for political asylum in the U.S., but it was denied. How do you say "chutzpah" in Urdu? That deportation case continues. According to a reader, Muhammed Masosod, former imam of the Islamic Center of New England in Sharon, has been trying to find work in Malaysia and Saudi Arabia. Masood is reportedly in KSA right now with his brother Hafiz Hamid, the former imam at the Islamic Center of Greater Worcester. Masood was reportedly in Malaysia for the past two months seeking a job there so he can for bring his family there, but had no luck in finding a job. The family is still in Sharon, and my reader writes that the family wants to leave the U.S. but they dont want to settle in Pakistan. That's understandable. Life was good in Sharon and Worcester for Hafiz Saeed's brothers, but things are tough now. Will try to find out when the Masood family deportation hearings continue. Told Ya So! LeT Terrorist Group Raises $$$ in U.S.
"For all the protestations that the Jamaat-ud-Dawa is a charitable organisation and Hafiz Mohammed Saeed is an injured innocent, it's clear that the organisation and Saeed's family, in particular, have been in the crosshairs of US government for several years and a couple of Saeed's family members are already in US custody." "As the Lashkar-e-Taiba grew in stature, profile and links to violent terrorism in Pakistan, curiously, its amir Saeed's family kept making tracks to the US to live and work there over the past decade. "Over the years, LeT aka Jamaat-ud-Dawa has morphed from an ISI-sponsored terror outfit against India to become a global jihadist organisation with increasing ties to Al Qaeda." "...Saeed's family had been making determined tracks to the US -- to live there as imams and preach and raise funds for jihad." Former Sharon imam Muhammed Masood is likely flying out of New York tonight and back to Pakistan. He's expected to land in Islamabad sometime tomorrow evening. What sort of reception will he receive there? Will the Pakistani papers cover this return of one of their own? "Tonight’s Pakistan Airlines flight from John F. Kennedy Airport in New York City to Islamabad will bring an end to a case that has lasted almost two years, first in immigration court and then with a criminal case for the same visa fraud charges." "....today, under an agreement with federal immigration authorities, the 50-year-old former imam of the 1,500-member Islamic Center of New England promised to leave the country Friday night and return to his native Pakistan to avoid being arrested and held in jail for months until he is deported." Thanks for reminder, Judge. US Attorney Michael J. Sullivan echoes that, saying that "this individual lied to immigration officials a number of times over a number of years." "...the former spiritual leader of the Islamic Center of New England’s Sharon mosque said he’s worried about returning to Pakistan at a time when violence there is escalating and political tensions are high." "Imam Masood was detained by federal immigration agents for visa violations in November 2006. The government arrested him on criminal visa fraud charges in August 2007, and has since pursued immigration and criminal cases for the same violations." "The imam pleaded guilty to five fraud charges in February, setting the stage for his deportation." The Patriot Ledger page has lots of excellent links about this story. Lambert has followed this case far more than any other reporter, and he's covered lots of angles. Kudos to Lambert and the Patriot Ledger for their coverage. Scroll down here for my previous postings on Masood and his brother-in-law Abdul Hannan, who were both arrested in November 2006. Kudos to our Immigration and Customs Enforcement folks and our US Attorneys. "Imam Muhammad Masood, brother of Hafiz Muhammad Saeed, founder of the banned Lashkar-e-Tayyaba, was ordered deported by a Boston, Massachusetts court on Thursday on an immigration violation charge." "Under an agreement with federal immigration authorities, the former imam of the 1,500-member Islamic Centre of New England agreed to voluntarily leave the United States on Friday night and return to Pakistan rather than be deported by the authorities which would have taken months, a period he would have spent in jail." Good gracious, this case has gone on for a long time. But it does appear that former Sharon, MA imam Muhammed Masood is finally being sentenced today, with a trip back to Pakistan on Friday. It's been almost two years since his arrest back in November 2006. On September 23, a "Joint Status Report" was filed in the federal court, but it's a sealed document. The September 26th sentencing hearing was postponed and rescheduled (again!) for today, October 2. The hearing will be at 2 PM before Judge Douglas P. Woodcock in Courtroom 1. The former imam was at the mike last weekend at the Friday noon and evening prayers at the Islamic Center of New England in Sharon. It's been a very long goodbye for Masood. You can read my previous postings on this case here, including info on Masood's numerous relatives both in Massachusetts and Pakistan. Much of his immediate family is apparently staying here, so the saga will continue. Meanwhile, back at Masood's mother country, the Pakistan government is allowing Masood's brother Hafiz Saeed to import a bullet-prooof Land Cruiser. You thought Pakistan was a mess under Musharraf? Things aren't really looking up under the new president, Asif Ali Zardari (aka "Mr. 10%"). Saeed is the founder of two banned terrorist groups - banned even in Pakistan - although his groups operate openly there. "The Pakistan government has granted permission to the chief of the Pakistan-based terrorist group, Lashkar-e-Toiba, Hafiz Mohammad Saeed, to import a duty free bullet-proof Land Cruiser, worth Rs 25 million"
"According to the interior ministry sources in Islamabad, the LeT chief, who fears a possible attempt on his life by his 'external enemies', had sought the government permission to import a duty free bullet proof Land Cruiser in view of the rising number of terrorist acts across Pakistan." "The sources said that after some lengthy deliberations on the issue, the government has decided to give him a go ahead to import a fully armoured Land Cruiser for his use from Dubai. It was for the first time that the leader of a banned jehadi group had made such a request to the government and it is also for the first time that the government has acceded to such a request." "The NEFA Foundation has obtained and translated Arabic-language biographies of foreign fighters-particularly those from Saudi Arabia and Kuwait-which appear to document a shift in focus away from the jihad in Iraq and towards the growing conflict in Pakistan and Afghanistan." Things could get crowded there in Pakistan for jihadis. Update on the likely future for former Sharon imam Muhammed Masood and his family: After the "voluntary deportation" hearing on October 26, 2008, Masood will leave the country and leave his family here. Apparently, Masood and his supporters hope that Masood can return after a year or two. "His wife and five of their children are urgently seeking housing in Sharon to enable them to stay within the school system. They need 3 bedrooms and have limited means. I know his family would be very grateful if the community can help them locate a place to move to. They have already spoken to the Sharon Housing Authority and there is no Section 8 available in town and the waiting list for Easton is so long they are not even accepting applications." "Also, the Sharon Advocate neglected to print notice of the upcoming Ramadan break fast at the mosque this Sunday evening. The ICNE community will especially welcome your presence as Imam Masood will be attending, so it will be a wonderful time for us to bid him a safe journey." Again? How many good bye events does Masood get? I checked with a ICNE member, and most of the ICNE Members do not know about this Break Fast event. Whose agenda is the ICNE's Board serving? "ISLAMABAD: A top jihadi leader in Pakistan is now scared of the jihadis and is seeking a bullet-proof vehicle to protect himself." "Hafiz Saeed, founder of the Jamaat-ul-Dawah, and before that Lashkar-e-Tayyaba, has applied for the import of an armoured vehicle, sources here reveal. " “ 'It is respectfully intimated that due to various incidents of terrorism in Pakistan, it has been decided to provide safeguard to Hafiz Saeed, (the chief of) Jamaat-ul-Dawah, through import of a fully armoured vehicle,' a letter, written to the Interior Ministry by the Jamaat-ul-Dawah, reads." "....Saeed not only seeks official permission for a bullet-proof vehicle, the letter he has written also requests exemption of import duty on “humanitarian grounds. 'It is further requested that the Federal Board of Revenue may also be directed to exempt the motor vehicle from the levy of all sorts of duties and taxes on humanitarian grounds,' the letter requests." Are we surprised? Chutzpah must run in the family. "When contacted, Jamaat-ul-Dawah spokesman confirmed the request. But unlike the threats to the life of Saeed spelled out in the letter, Yahya Mujahid, the spokesman, claimed the leader was under 'threat from the Indian side,' making an oblique reference of the outfit’s militant activities in Indian-administered Kashmir.."
The application has been turned down. Wondering why more ICNE members (many with family back in Pakistan) aren't saying publicly that they're glad Masood is being deported? ....for Muhammed Masood and his family. According to an anonymous tip I received this morning, Masood's brother Hamid* (former imam of the Islamic Society of Greater Worcester) has been busy travelling from Pakistan to Dubai, where he purchased two luxury condos, one for himself and one for his brother Masood. Can you imagine how over-the-top a luxury condo in Dubai would be?? Wowee. So did any of that money to buy condos in Dubai come from the Muslim American Society (MAS) fundraisers for Masood? MAS has held several fundraisers for Masood over the past two years now, including one held in Roxbury two weeks ago, down the street from the Islamic Society of Boston. I'd be mighty ticked off if I gave my hard-earned money to MAS and it went towards a luxury condo in Dubai for an admitted liar. Masood's attorneys filed a memorandum to the court in May 2008, saying that Masood had an income of -$961, and they requested that the court waive his fine. From a leafy 52-acre estate in Sharon to a luxury condo in Dubai? Not too shabby. I knew Masood would bounce back. Most people convicted of lying repeatedly to federal agents and providing false information on their visa applications see jail time or are summarily deported. But not Masood. He gets repeated postponements, probation, a waive of his fine, a "voluntary departure" and now - reportedly - a luxury condo in Dubai. Where is the justice? My previous postings on the Masood case here. * Hamid skedaddled out of the U.S. in a mad hurry in June 2007. Gave himself a voluntary departure before things got hot for him. Hamid and Masood are, as Miss Kelly readers know, brothers of Hafiz Saeed, the founder of Pakistani terrorist group Lashkar-e-Toiba, and a successor organization, Jamat ud-Dawa. More on Hafiz Saeed here. Hamid originally came to the U.S. in 2001 to attend the Harvard's Islamic Financing conference, reportedly assisted by S. Nazim Ali of Harvard. "Today (August 1, 2008) was to have been the day Imam Muhammad Masood was sentenced to probation for visa fraud convictions, followed soon by his voluntary departure from the country." "Instead, the former spiritual leader of the Islamic Center of New England's Sharon mosque is awaiting a late September court date, as his attorneys try to work out a deal with government lawyers to keep him out of jail between his sentencing and his departure." "The legal battle over the terms of his exit is spelled out in the latest documents filed at U.S. District Court in Boston." "In a joint motion filed July 24, Imam Masood's criminal attorney, Norman Zalkind of Boston, and Justice Department lawyers asked for a delay until Sept. 17 or later because it's still not clear whether Immigration and Customs Enforcement (ICE) will agree to let the imam stay free on bail until he boards a plane out of the U.S."
"Imam Masood pleaded guilty to five counts of visa fraud in February, in a deal that would put him on probation until his deportation was settled. His attorneys, immigration lawyer William Joyce of Duxbury and Zalkind, now say he's ready to go without a court fight, probably to his native Pakistan." The same Pakistan that was so dangerous for him to go back to a few months ago? Masood was contemplating seeking political asylum here in the U.S., claiming that it was too dangerous for him to return to. Maybe that was the last straw for the feds. Previous blog postings on this case here (scroll down). What, no jail time for former Imam Muhammed Masood, despite the conviction for lying to federal agents? The Boston Muslim American Society and the Islamic Council of New England are holding a "special Farewell Dinner" and fundraiser for Masood and his family tomorrow, July 26, 2008 (6 PM) at Ashur's Restaurant, behind the yet-to-be-finished Islamic Cultural Center in Roxbury. "Imam Masood will be leaving the US, with his family, on August 2nd, according to an agreement he has reached with his case. This event will go towards funding the travel expenses for 10 family members, and to support the family in their time in need. Funds will also go towards helping local Muslim immigrant families experiencing financial hardship." What's so special about Masood? I bet Emadeddin Muntasser wished that the local MAS would have helped him out. I bet Martha Stewart and Marion Jones wished they could have avoided jail time for lying to federal agents. How does Masood escape jail time? Is there a different justice system for the brother of Hafiz Saeed? You can make a financial donation at the MAS website here (select "Shaikh Masood Family Support" in the drop-down menu). The website says that "All donations to MAS Boston are tax deductible." Hmmm, here we go again. Is it really tax deductible to give money to a criminal who's essentially being deported from the U.S.? The MAS/ICB e-mail states that Masood and his family are leaving the country on August 2nd. Who is going to supervise Masood's three year probation that was part of his plea agreement? Masood, with his criminal convictions, gets to board a plane and skedaddle out of here. What's going on here? Is this simply the most expedient way to deport Masood and his family? If that's the case, I'm OK with that. I don't see the need for my tax dollars to support these folks in jail and subsidize their dawah there. Fine, let them all leave now. I welcome any legal minds out there to shed some light on this. Previous postings on the Muhammed Masood/Abdul Hannan case here (scroll down). UPDATE: Hmmm, now why would the MAS send out an e-mail dated Tuesday, July 22nd, announcing that Masood and his family are leaving on August 2nd, when Masood's sentencing has been postponed from August 1 to September 26th, 2008? The motion for continuance of the sentencing was filed on July 22nd, and granted on July 23rd (masood_sept_08_continuance.pdf ). Maybe they're not going anywhere for a while after all. Such a strange case this has been. "On May 22, 2008, the Court discussed the issue of the Immigration and Customs Enforcement (ICE) administrative removal proceedings with the parties, allowed the defendant’s motion to continue sentencing, and instructed the parties to attempt to resolve the immigration issue." "The parties hereby notify the Court that as relates to the administrative immigration proceedings, the defendant, through his immigration attorney, and ICE, through their attorneys, have the outline of a mutually amenable agreement, but there are several details to resolve which have not yet been worked out. In order to effectuate the agreement, the parties request that sentencing in this matter, currently scheduled for June 5, 2008, be continued for approximately 60 days, until August 1, 2008. On that date, the parties anticipate that the defendant will present himself for sentencing by this Court and for resolution of the immigration removal proceedings on the same day. During the interim time period, the necessary logistics will be resolved to synchronize the conclusion of these matters. If the remaining details prove to be an obstacle to the resolution, the parties agree to file a motion to advance the case for an interim hearing." Judge Douglas P. Woodlock granted the Joint Motion to Continue Sentencing, and sentencing is reset for August 1, 2008. It is likely that the government and Masood will work out a "voluntary deportation." Where will Masood and his family end up? My guess is either United Arab Emirates or Egypt. Feminine intuition. Previous blog posts on this case here (scroll down). "With near-certain deportation looming, Imam Muhammad Masood’s immigration attorney says the Pakistani cleric and his family are ready – though reluctantly – to talk about voluntarily leaving the United States rather than fight removal proceedings in federal Immigration Court. 'The imam is trying to explore an orderly voluntary departure,' attorney William Joyce of Duxbury said. What's to fight really? He's here illegally, and he admitted to lying repeatedly to federal agents about a good many different things. Most other countries would have sent him back a long time ago. Still, I'm OK with a "voluntary" departure. Why waste our tax dollars and court rooms deporting him? This beats the heck out Masood's amusing idea that he might seek political asylum here. Admittedly, we've gone a little soft as a nation, but we aren't that soft. "Joyce, a former immigration judge, said the family may consider going to a country other than Pakistan, if they could be admitted. Until now, Joyce has said the imam and his family might seek asylum, on the grounds that returning to Pakistan would be dangerous." How do you say "chutzpah" in Urdu? So dangerous in Pakistan that Masood has countless siblings and cousins living there, many of whom have gone back and forth between Worcester and Sharon and Pakistan over the years. But now it's become too dangerous? Not gonna fly, people. The second Patriot Ledger article asks, "Why has the government pursued a criminal case against Imam Muhammad Masood, when he already faced probable deportation for immigration charges?" Apparently, there are critics who feel that the feds are "making a federal case" out of Masood. What Masood did and the nature of the charges against him are what made this a federal case. Don't blame the system. Blame the person who tried to subvert the system. "The 50-year-old Pakistan native wasn’t accused – at least publicly – of having ties with extremist groups. But the fact that one of his brothers is a terrorist leader has led to much speculation about the true nature of the government’s aims." "The criminal counts against Masood were the same as the visa violations for which he was detained by Immigration and Customs Enforcement agents in November 2006. Both charged he didn’t leave the United States in 1991, as required by his student visa, and then lied about that and several other things when he applied for a Permanent Resident Card, popularly known as a 'green card.' "
"In February, he pleaded guilty to five charges of visa fraud. If he’s sentenced to three years of probation next week, as expected, his deportation proceedings will resume in Immigration Court." "The double prosecution has led many in the Muslim community – and some non-Muslims as well – to wonder whether the government’s real aim has been to pressure him for information about his brothers, Imam Mahmood Hamid and terrorist leader Muhammad Saeed." "Saeed is notorious, from Pakistan to the United Nations, which has banned his group Lashkar-e-Toiba (Soldiers of the Pure). Imam Hamid was spiritual leader of the Worcester Islamic Center from 1999 until last June, when he and his family abruptly flew back to Pakistan amid questions about his visa status." Soldiers of the Pure. Salafi? Takfiri ideology? The rest of the article speculates on why the government handled the case as it has, with comments from area legal types. I applaud the government for enforcing our laws (I will forgive how long it took them to catch up!). Whether it's tax evasion or immigration violations, I support the feds using whatever tools they have at their disposal to enforce immigration laws and to keep relatives of terrorists from setting up shop in the U.S. Previous postings on the case here (scroll down). I Hope Masood Doesn't Pull a Hamid! When I read that a federal judge has delayed the sentencing of former imam Muhammed Masood, who was about to be escorted to jail, I thought to myself: "I hope Masood doesn't pull a Hamid." 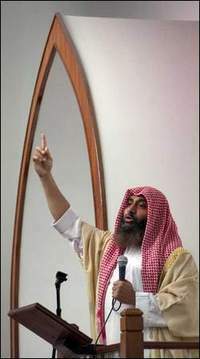 A little over a year ago, Masood's brother Hamid Mahmud, former imam at the Islamic Center of Greater Worcester (aka Muhammed Hamid, Hafiz Hamid, Hamid Mehmud, Hamid Mahmud and Hamid Mehmood) made a dramatic "exit stage left." According to my sources, Imam Hamid was about to be subpoenaed for a federal grand jury, and he skidaddled out of here tout de suite. His friends first tried to get a flight out of Boston to Pakistan via London, but he had difficulty because the Brits refused permission on the grounds that his visa wasn't in order. Shockah! So Hamid's good friends drove him and his family to New York in the wee hours of the morning, and somehow managed to get a flight from NYC to Pakistan for Hamid, his shuttlecock-burqua'd wife, and five children. Exciting! Now that Masood knows he faces jail time, that would be strong motivation for an attempt at fleeing the country. "Government lawyers wanted to put Imam Muhammad (shown at left) Masood back in jail on Thursday, but a federal judge wouldn’t let them." "U.S. District Court Judge Douglas Woodlock was prepared to sentence the former Islamic Center of New England cleric to three years’ probation, or possibly set a tougher penalty, for visa fraud charges." "Instead, a clearly angered Woodlock postponed the sentencing until June 5, when he was told that Immigration and Customs Enforcement agents planned to take Imam Masood back into custody as soon as he left the court. "Five Federal Protective Services vehicles were parked outside the Moakley Courthouse, waiting to whisk the imam to jail." "U.S. Attorney Michael Sullivan of Abington attended the brief session, but had no comment afterward." "Imam Masood’s lawyers said they were told of the immigration agency’s plans at 4:50 p.m. Wednesday, barely 24 hours before the scheduled sentencing session. They filed an emergency motion for the delay Thursday morning." "The imam’s attorney Norman Zalkind said it all parties had agreed that Imam Masood would remain free on a $10,000 bond while his deportation case resumed in federal Immigration Court." "By the way what hell the brother of Hafiz Saeed [Chief of an Anti Indian Jihadi Org worked and kept active under the very nose of Pakistan Army (Coalition of the Willing under USA) from 1999-to date] was doing in the USA? How the hell he reached to the USA?" Good question. How the hell he reached the USA? And why is a federal judge trying to "slow the ball down"? Speed this ball up! People in Pakistan and India are incredulous about this, as well as the other Hafiz Saeed relations here in the U.S., two of whom are still here, one in Lowell. "he (Masood) came to love the United States after spending some years here and the greatest wish he had was to say that America was his country. He thought that the educational and employment opportunities, especially for his daughters, would be much better in the United States than Pakistan." Masood still has his interfaith supporters,although their numbers have dwindled since the arrest in November 2006. Exhibit A of the memorandum is a letter of support from Rabbi Barry Star of Temple Israel in Sharon, who writes that "Masood has worked to make Sharon a model community for interfaith relations." Leafy, affluent Sharon is probably not a tough beat for interfaith relations. Not everyone found him to be a good interfaith model. Masood has admitted that he lied repeatedly. What sort of religious leader is that? Would you want him teaching ethics and morals to your kids? Why is Rabbi Starr supporting this man? Exhibit B is a letter of support from Paul Peckham, a member of the Walpole Peace and Justice Group, who wrote that Masood is a man of "great patience" and is a "wonderful, caring man." The Walpole Peace and Justice Commission is a pretty uber-left wing group which seems to mainly hold peace vigils on the Walpole Common. The parent organization, United for Peace and Justice, is an anti-war, pro-Castro group. Mr. Peckham himself traveled to Venezuela in January 2006 as part of the "Global Exchange Reality Tour," and he wrote that he was mightily impressed with the Social Revolution of Veenzuela under Chavez. Buy Citgo! Support Chavez! I'm afraid Mr. Peckham is a rather poor judge of character. 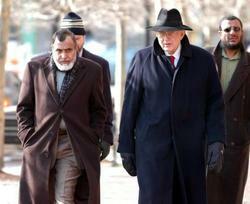 There's a hearing today at 3 PM, Moakley Courthouse in South Boston, for former Sharon imam Muhammed Masood. Stay tuned, I'll provide details as soon as I hear anything. As reported last February, Masood pleaded guilty to five counts of giving false statements and visa fraud. Masood was picked up in a multi-state immigration sweep in November 2006, then indicted on criminal charges last August. He separately faces deportation; that hearing is scheduled for April 2009. "Yesterday, at 4:40 PM, Masood's counsel was informed by the government that there is an immigration detainer on Masood and that immigration authorities intend to detain Masood after today's sentencing." The motion states that Masood's immigration attorney William Joyce is going to Dubai today and will be gone for a week. Norman Zalkind is going on vacation next week. As if they didn't know about this sentencing hearing! "Masood is asking the court for a short continuance of the sentencing for 2-3 weeks to give his immigration attorney time to see if something can be worked out with the immigration authorities to avoid Masood's detention after being sentenced in this criminal case." Too bad the Hashmis of Toledo, Ohio didn't have a slick lawyer who would see if something could be worked out. Why isn't Muhammed Masood Being Deported Too? Compared to this Pakistani couple, Muhamed Masood appears to be getting off easy, with his recommended sentence of only three years probation for his immigration fraud, his repeated lying throughout his years here in the U.S. Why is Masood being treated differently? This Pakistani couple had no criminal activities and they weren't accused of repeatedly lying. The couple also had children born here who are now American citizens. So why on earth has the federal government recommended probation for Muhammed Masood and immediate deportation for Mr. and Mrs. Waheed Hashmi (in their 60's)? Perhaps we'll learn more on May 22nd, when Masood has his sentencing hearing. I'd really like to know why the federal government has lowered the bar for Masood. "A West Toledo couple were released yesterday from federal detention and allowed to return home - temporarily - more than a week after immigration authorities picked them up so they could be deported to their native Pakistan." " 'As unbelievable and crazy as this past week has been, I feel nothing but relieved and incredibly lucky that they're coming home,' their daughter, Anita Severance, said last night. Her parents, Waheed Hashmi, 69, and his wife, Nusrat Hashmi, 63, were taken from their home April 29 by agents of U.S. Immigration and Customs Enforcement and until yesterday, were in a suburban Cleveland jail." "Greg Palmore, an immigration and customs spokesman, said Mr. Hashmi came to the United States on a valid student visa in June, 1973. An extension allowed him to stay until September, 1977." "`'At some point, they'll be removed from the United States,' Mr. Palmore said. "They did not abide by the judge's ruling, and now [Immigration and Customs Enforcement] will have to remove them at the government's expense.' But Mrs. Severance said the couple worked on gaining legal status for years." "Mr. Hashmi, who received his doctorate from Bowling Green State University, directed animal research facilities for more than a decade at the University of Toledo. He retired last year, his daughter said. He had proper employment authorization for much of that time and the couple had been fighting through appeals in order to stay, she said." Sounds like Mr. Hashmi was an upstanding citizen who contributed to his community. That our immigration laws are so convoluted and difficult that model citizens can't stay here is shameful. Masood, on the other hand, is a different story. His continued presence in the U.S. beyond his initial two years on an exchange visitor visa was predicated on lie after lie, about his education, work experience, going back to Pakistan (didn't), missing his son's birth (didn't! ), about "the men in suits who did not have badges" who smuggled him back into the U.S. Please read the federal agent's affadavit for the criminal case, the litany of fasehoods is jaw-dropping. Masood should never have been allowed to stay here as long as he did. Now that he has pleaded guilty to making five counts of making false statements to federal agents, he and his family should be deported immediately as well. We are a society based on the rule of law, and our laws should apply equally to everybody. Muhammed Masood and his family have got to go back to Pakistan too. Yowza, there's a petition circulating in the Islamic Center of New England community of Sharon and Quincy, Massachusetts, and it packs a punch. Clearly, some ICNE members are very angry about what their Board of Directors has done over the past few years on three issues: 1) forcing former Imam Talal Eid out, 2) installing Muhammed Masood as imam, and 3) the takeover of the ICNE school (Islamic Academy of New England, IANE) done indirectly by the Islamic Society of Boston. (More on this later, the role of ISB's imam Basyouney Nehela at the IANE.) They believe that the actions of the Board have been illegal. Here is the letter and petition sent to the ICNE Board of Directors. Islamic Center of New England Inc. I am sending you the petition that was sent to you and on April 14, 2005. You never held a General Body meeting and never resolved the issues raised therein. See Exhibit 1. I am also sending you the release by the US Attorney office that shows the criminal enterprise you were supporting. From this release it appears that you were trying to support the visa application of an undocumented person (referring to Muhammed Masood- ed) at the loss of Religious Director of the community (referring to Talal Eid - ed). This is violation of many US Laws. See Exhibit 2. You can resolve this matter amicably within the community or by further litigation. Let me know what is your choice. Also you are in breach of fiduciary duty by keeping a house occupied by a non-employee (refers to Masood's family-ed) that was needed for use by the Ladies Auxiliary. This is violation of the tax exempt status and also you have never been authorized by the General Body to waste the resources of the ICNE Inc. You will be held liable for this waste. This petition was received by the Secretary on April 14, 2005. A. It is resolved that the members of the BOD who precipitated the resignation of Imam Talal Eid, and those who accepted it without following the rules of business be impeached. B. It is resolved that the members of the BOD or ex-officio members of the BOD who have misinformed the General Body about their degrees that they did not attain (Names to be filled in at the meeting), be impeached and referred to the authorities for prosecution. C. It is resolved that in addition to the members of the BOD, the spokespersons for this petition (Br. Shahadat H. Sarwahrdy and Br Z.Durrani) be given access to the ICNE record to year 1992 to determine the persons involved in taking away the resources of the ICNE (particularly schools run at ICNE properties) and if deemed necessary refer them to the authorities for prosecution. The signature of members is on file with the Spokespersons and also forwarding by registered mail to ICNE Secretary. I thought I'd do a timeline of the relationship between former Sharon imam Muhammed Masood and the Boston branch of the Muslim America Society (MAS). Masood recently pled guilty to five charges of making false statements and visa fraud. His sentencing is scheduled for May 22, 2008. There's also a deportation hearing scheduled for Masood and his family in April 2009. The Boston MAS has staunchly defended Masood, which is in character with national MAS's penchant for defending convicted Islamists such as Abdurahman Alamoudi and Sami Al-Arian. November 15, 2006 - Muhammed Masood, his son and his brother-in-law (and cousin) Abdul Hannan are both picked up in Boston, part of a nation-wide sweep in which 33 people were arrested for religious visa fraud. 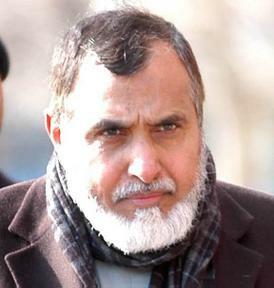 Masood was a teacher at the Islamic Academy of New England (IANE), before he became the imam for the Sharon, MA Islamic Center of New England (ICNE). Masood and Hannan were linked to Muhammed Khalil, who was convicted of religious visa fraud in 2004. Boston Globe story here. A fourth person was arrested in Worcester, but the name of person was not made public. Within a few hours (gotta admire their speed and organization), the Boston branch of the Muslim American Society sends out an e-mail to local Muslim groups: "The Muslim community in Boston is deeply concerned and outraged due to the recent arrests of two leading Imams in the Greater Boston community on alleged administrative violations of immigration policies." Nancy Murray, Director of the Boston ACLU's Civil Liberties Task Force says ""On the surface, this appears to be yet another action unfairly targeting the local Muslim community." November 16, 2006 - National MAS issues their statement, including this: "The arrests of these two Imams by immigration officials and police clearly demonstrate that the climate for fear and presumed guilt is still operating in America. Muslims are frequently assumed guilty until proven innocent, and there is little, if any, respect shown to our elders and community leaders." What Did ICNE Board of Directors Know About Masood? And now, a message from our local Department of Justice on the Masood case (scroll down for my previous blogposts on this case). Below is the full text of the DOJ press release about the charges brought against Muhammed Masood, former imam of the Islamic Center of New England (ICNE) in Sharon, MA. It appears that there were Board of Directors at ICNE who knew Masood since 1987 and who were "in cahoots" with him since 1998. Various ICNE members brought up the issue of visa irregularities with the ICNE Board of Directors several years ago. Will anything happen to the ICNE Directors who hired and kept Masood on, even though he lacked proper visa documentation? BOSTON, MA - A Sharon man was convicted today in federal court of fraud and misuse of documents required by the immigration laws, making false statements in a matter relating to the registry of aliens, and making false statements to Immigration and Customs Enforcement and Citizenship and Immigration Services ("Immigration Officials"). United States Attorney Michael J. Sullivan, Bruce Foucart, Special Agent in Charge of Immigration and Customs Enforcement (ICE) in New England, and Warren T. Bamford, Special Agent in Charge of the Federal Bureau of Investigation (FBI) Boston Field Division announced today that MUHAMMAD MASOOD, age 49, of 74 Chase Drive, Sharon, MA, pleaded guilty before U.S. District Judge Douglas P. Woodlock to five counts of an indictment charging MASOOD with fraud and misuse of documents required by the immigration laws, making false statements in a matter relating to the registry of aliens, and making false statements to Citizenship and Immigration Services. "Immigration Laws Are Intended for All"
"One of the many things that separate us from other countries is that we are a nation of laws and at the core of our judicial system is a belief that the laws be applied evenhandedly." "Imam Muhammad Masood has contributed much to the region as former spiritual leader of the Islamic Center of New England’s Sharon mosque but his violation of the immigration laws and his admitted lying should result in his deportation." " ....While we empathize with Imam Masood’s plight, we cannot excuse the fact he lied to federal officials..... allowing Masood to remain would open the floodgates to any number of illegal immigrants looking to circumvent the system. "We continue to support Imam Masood as a loved and respected leader in our community and urge government agencies responsible for his continuing immigration case to allow him to continue to live in his adopted homeland." "According to the Transactional Records Access Clearinghouse at Syracuse University, Masood is clearly not being singled out. Between 2004 and 2006, the Department of Homeland Security brought criminal immigration charges against 814,073. Of that, more than 86 percent involved a variety of immigration violations such as entering the U.S. without an inspection, not having a valid immigrant visa or overstaying a student visa." Kudos to the Patriot Ledger for stating the obvious, something which other newspapers, interfaith supporters and the Boston MAS can't bring themselves to do. And where is Imam's apology for his repeated lying? I guess being a Wahabi/Salafi Muslim means never having to say you're sorry. "Iman Muhammad Masood, the former spiritual leader of the Islamic Center of New England in Sharon, plead guilty today to five counts of giving false statements and visa fraud." "With the plea agreement now in place, sentencing is scheduled for May 22. His attorney and the government have reportedly agreed that the government will recommend three years probation."